For one weekend every September, Michael Franti takes over San Francisco, staging a free festival called Power to the Peaceful in Golden Gate Park and putting on a number of pre-, post- and after- events around the city, including group yoga sessions and kids' workshops. As for the festival itself, this year it drew an estimated 70,000 to the park's historic Speedway Meadows. After a full day of speakers and other bands (including Fort Knox Five and Rebelution), Michael Franti and Spearhead stormed the stage for an afternoon of dancing, jumping and positive vibrations. 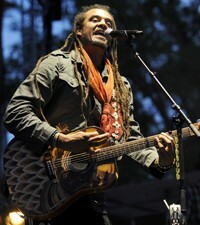 "Over the years, 'Power to the Peaceful' has changed from a protest event to an action event," Franti told Spinner backstage before his set. "We bring in over 100 social justice and environmental organizations. We bring people into the park, with music -- and we invite people to volunteer. I feel that that's the best way to remember September 11 ... volunteering to do something positive is so much better than burning the Quran." True to form, Franti opened up his set with the inclusive 'Everyone Deserves Music' ("Even our worst enemies / they deserve music!") and continued to inspire the audience to dance, keeping the politics to a minimum. The hundreds of booths lining the perimeter was the place for people to participate in social action, learn more about certain environmental causes or, in one case, get evaluated instantly by a doctor to see if they qualify for a medical marijuana recommendation. After Saturday's festival, Franti took the party to the Fillmore where he led an all-star cast through a set of Talking Heads covers. One of the guests: original Talking Heads member Jerry Harrison on keys. Not a bad way to promote a message of peace, love and music.